Previous PPEOs demonstrate how universal energy access is key to achieving almost every Sustainable Development Goal. We know that appropriate and sustainable financing is, in turn, key to achieving universal energy access - but what sorts of financing mechanisms are actually available, and are they reaching the people most in need? The availability of finance is a central driver of progress towards achieving universal access to electricity and clean cooking; and decentralised energy systems have, in recent times, attracted new funding from a range of sources. However, it is widely recognised that this new financing is not enough, and not all of the correct type, to ensure the world reaches its challenging goal of universal, sustainable and modern energy access by 2030. It is also clear that a large funding gap remains. In 2013, $13.1 billion was invested in energy access, with 97% targeting electricity and only 3% spent on clean cooking. Much of this was concentrated in a few countries, and such investments were overwhelmingly directed to the power sector; either to increase generation capacity or to extend the grid. Clearly, appropriate and sustainable financing will be the key to achieving SDG7. In PPEO 2016, we created integrated energy access plans for 12 communities in Bangladesh, Kenya and Togo, based on communities' energy access priorities. 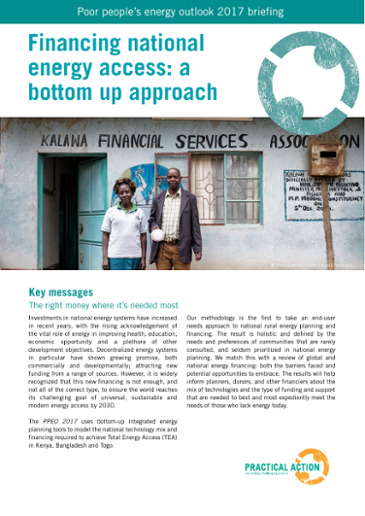 In the 2017 edition, we scale these community energy plans to the national level, generating national financing estimates, and, using community figures on willingness to pay, estimate the financing gap. We also create estimates for the cooking and electricity technology mix that would close the national access gap; situating these estimates within the national and global energy access financing contexts. National financing strategies need to address energy for productive and community uses as urgently as household needs. This can account for a substantial part of the costs of provision. Wider programmes of market activation are required to build collaboration and trust between stakeholders. The report is the second in a suite of three new PPEOs; it is preceded by the PPEO 2016 which explores energy access planning from the bottom up, and will be followed by the PPEO 2018 which will look at how to achieve integrated energy access at scale. The following infographics show the sorts of financing and technologies required to achieve universal energy access in our three case study countries by 2030, as well as how finance flows can help to stimulate market development. Watch our simple animation to see how and why our approach is unique. The PPEO research was first launched at the Vienna Energy Forum with comments from the World Bank, Global Alliance for Clean Cookstoves (GACC), and the Private Finance Advisory Network (PFAN). The video recording of this panel is available below.